September 15th, 2017 | Uncategorized. What makes a truly great moving truck driver, one who stands out in the minds of customers and coworkers alike? Whether it’s personality, experience, luck or a combination of all three, some drivers manage to excel in their field and leave a lasting impression on everyone they meet. For the past five decades, Paul Seiffert has been such a driver. 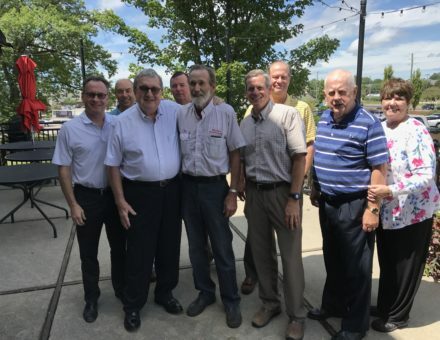 Paul retired in August with 56 years and nearly 2.5 million safe miles under his belt, having won at least 19 company awards and forged many strong connections with others at Wheaton. Paul’s safety record and many awards speak for themselves, but we sat down with him for a more in-depth look at what it’s like to succeed in the moving business for more than half a century. We started with a simple question: What drove Paul to become a driver in the first place? “Going from 25 cents to 2 dollars an hour,” Paul said without missing a beat. “That was 1962.” Paul accepted an offer to leave behind the job he had worked through high school and begin driving for Move Way in Minneapolis. He graduated on a Friday, and the following Monday, he went to work. Paul began hauling interstate shipments the following year, driving a Wheaton truck when he headed east and a Lions Van Lines truck when he went west. He was soon contracted to drive another man’s truck out of Las Cruces, N.M. for a year. After frequent good reports on Paul’s professionalism and abilities, Lions offered to buy him his own truck. Amid these negotiations, Paul was informed that a letter had been following him around for the last year. The letter was from his mother: He’d been drafted. Despite this brief roadblock, Paul stuck with the moving business and continued to make a name for himself as a dependable, personable driver, well-liked and respected by his colleagues and customers. Fifty-six years is a long time to spend in any business, and Paul has seen countless changes to moving and to Wheaton itself. The only recompense for that help was usually being treated to dinner and good conversation. That kind of camaraderie is something Paul would like to see more of among today’s drivers, citing those good relationships as one of the keys to his enduring success. Another important relationship in Paul’s life is his marriage to his wife, Kay. Paul and Kay celebrated their 52nd anniversary in August. “It cost me a hundred dollars,” Paul joked. “My wife likes lobster.” Because August is such a busy month in the moving industry, this was one of the first times in 40 years that Paul was able to spend his anniversary at home. He credits his long, happy marriage to his wife’s patience and hard work. “She did it all. She raised the kids, took care of everything at home. Special woman,” he said. Paul and Kay had three children: One daughter in 1968, a second daughter in 1970, and a son in 1977 who, sadly, passed away. They enjoy nine grandchildren and two great-grandchildren, and they have another great-grandchild on the way. How has Paul made such an impact on so many? He says that the secret to success is being proud of what you do and doing it to the best of your ability. When asked what advice he would give to young drivers, he emphasized thinking before you act and considering the impact that your decisions will have on you, your customers and the company. It’s also important, Paul said, to understand your customers and adjust your approach accordingly. “I’ve always enjoyed the work… Even though you do the same thing day in and day out, you’ve always got different customers. You handle them differently to get along with them.” He pointed out that some customers are all business, while others respond to joking and friendliness. Being able to tell the difference can help drivers leave a great impression wherever they go. One of Paul’s favorite stories comes from his early days with Wheaton, when he and a few other young drivers were playing football in the corporate parking lot between moves. They spotted an older man who was walking around nearby, picking up trash on the grounds. One of the drivers pointed out the old man and said, “We’re so lucky to have jobs!” They all assumed that the man was homeless or unemployed. Paul knew better. “That’s Mr. Earnest Wheaton,” he informed the others. Aside from being a humorous moment, Paul always appreciated that Wheaton’s founder, Earnest Wheaton, led by example. No task was beneath him. That same kind of humility is immediately evident when talking with Paul, who dodges praise and shies away from the spotlight. Still, we think it’s important to recognize Paul Seiffert and hold him up as an example of how to be the best you can be, both as a driver and as a friend. Congratulations on your retirement, Paul, and thank you for 56 years of moving people’s lives!